We're really excited to announce that next May, our annual charity ride Rally Indochina will be heading north for the first time to visit the northern mountains, including Dien Bien Phu and Sapa. At the time of blogging, six riders and pillions have already committed to ride with Rally Indochina in 2016, and there's been plenty of interest from other riders! One of the reasons that we're so excited to be heading north is that the organisers of Rally Indochina made all of their initial exploratory rides in Vietnam's northern mountains, a beautiful region that's home to rugged peaks, terraced rice paddies and colourful hill tribes. Between May 2nd and May 11th in 2016, the Rally will be visiting the hill tribe villages of Mai Chau, Mu Cang Chai, Sin Ho, the historic battlefields at Dien Bien Phu, and will cross the highest mountain pass in Vietnam to visit the famous hill station at Sapa. We can't wait to show this region off to riders on Rally Indochina, some of whom have ridden with us before but are keen to see a different part of Vietnam. It promises to be an unforgettable adventure, and it's all for a great cause! Another reason we're heading north next year is that the beneficiary, Blue Dragon Children's Foundation, has almost completed the work Rally Indochina has been supporting in central Vietnam. Blue Dragon is now focusing this work on the northern provinces, where it has found children at risk of trafficking to Ho Chi Minh City or across the border. 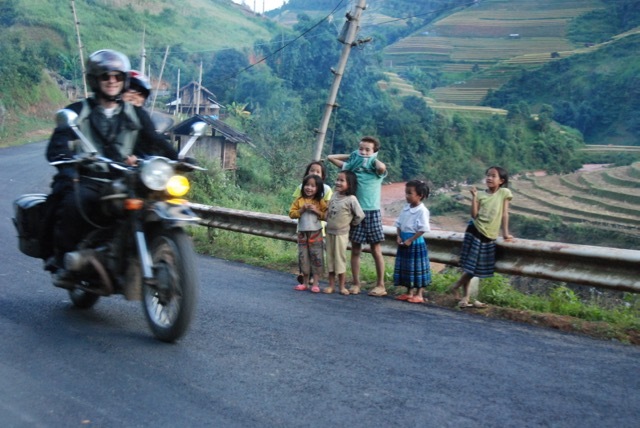 Every year since 2011, Explore Indochina and our friends in Hoi An have jointly organised Rally Indochina, riding the Ho Chi Minh Trail from Hanoi to central Vietnam to raise money for disadvantaged Vietnamese children. We run the Rally exclusively on Explore Indochina's fleet of classic Ural and Minsk motorcycles. So far, over 70 riders from around the world have raised about US$182,000 for Blue Dragon and its campaign against the trafficking of children. The Rally organisers are proud to be able to support this incredible organisation, and to have watched the foundation grow over the past decade. To find out more about the Rally, head to Rally Indochina or email us at [email protected].